By witnessing a view, as if the tourists were sightseeing. Canoes laden with merchandise vegetables, fruits, all kinds of fish and other household needs is available in the market afloat. 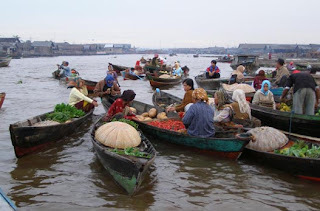 As the sun began to emerge the market gradually began to retreat, the merchants began to leave the floating market with the results obtained with satisfaction. Floating market atmosphere that is unique and special are jostling between large and small boats to find each other buyers and sellers who are always milling around and always shaky play Barito river waves. 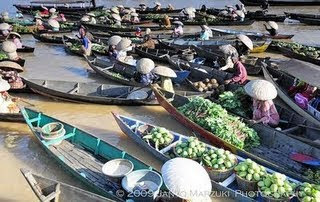 Floating market does not have an organization like the market on the mainland, so not recorded how many traders and visitors, or distribution of merchandise bersarkan merchants. Women traders who sell their products boating alone or neighbors called the hamlet, while the second hand from the hamlet of buying for resale called panyambangan. Keistemewaan market is still common barter transactions between the traders and boating, which in the language called Banjar bapanduk, something unique and rare. 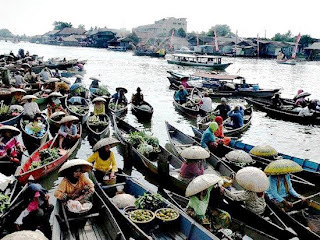 Sightseeing is often regarded as a fantastic attraction, Banjarmasin like Venice in the Eastern world, because they have the potential of river tourism. However different the two cities and natural cultural background. In Banjarmasin still mostly found along the river floating houses called lanting house, which is always shaky play wave. Regional and Health is a type of settlement is along the river (waterfront village) which has several tourist attractions, either in the form of nature tourism, cultural tourism and cultural tourism. 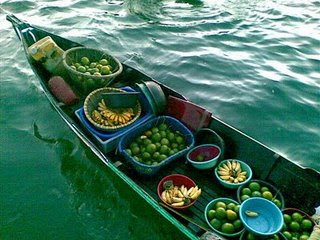 Lives of people close to the river of life as a floating market, the riverside village with its traditional architecture. Lower mudiknya various traditional boats with various loads is an interesting attraction for tourists, even expected to be developed as tourist villages that could be forming the image in the promotion of tourism in South Kalimantan. Still in the same region tourists can also visit Tuan Guru Mosque and Masjid Tuan Guru, Kembang island, islands and island Bakut Surprise. In the craft and Health have also carved to ornament the house of Banjar.